New technologies present mind-bending possibilities for human “optimization.” But should we use them? From self-driving cars to the recent Equifax cyberattacks, headlines about emerging technologies remind us that the world is quickly changing in complex and unpredictable ways. The biomedical field is no exception. Just this August, the front page of major media outlets reported that researchers in the United States edited the DNA in human embryonic cells. Behind the renewed interest in genome editing is CRISPR, a recently discovered tool that makes editing DNA cheaper, easier, and more accurate. Researchers hope to use CRISPR technology to explore the possibility of “editing out” genes that lead to disease, among other uses. At the same time, experts in artificial intelligence (AI) are working to bring computers into the clinic. Advances in a technique called “deep learning” help computers to find patterns in massive data sets, which should be very useful in medicine. Already, researchers are working to teach AI to diagnose some skin diseases by looking at photos of the conditions, and AI will probably continue into learning radiology. Some companies are even using deep learning to work out the genetic drivers of human disease. Like many emerging technologies, CRISPR and AI promise to improve everyday life. But they also come with complicated ethical, legal, and social issues. Should editing disease out of human embryos be allowed? Would it be safe? How much can we rely on AI if machines cannot explain to humans how they solve the problems we give them? Many questions remain unanswered. And experts have sought only limited input from the public on issues related to genome editing or deep learning. These issues are only amplified in importance and complexity when considering using both technologies together. We are barely able to think through the consequences of using one of these innovations in medicine, but it already could be time to consider how CRISPR and AI might work together in addressing stubborn human health problems. Eleonore Pauwels and I co-authored a recent report from the Wilson Center in Washington, DC, which anticipates that experts could use both technologies together to “optimize” human health. If AI can help with understanding how genetics leads to disease, then AI may be able to use our current knowledge about genetics to predict what combination of genes would make the healthiest human imaginable. 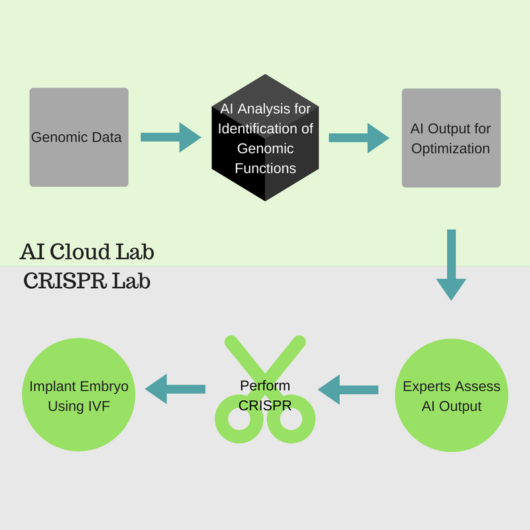 Perhaps AI could even give recommendations on where to use CRISPR to edit human embryos. Experts could review those recommendations, and use it to guide the actual editing process—ultimately helping doctors to create an “optimized” child. Though much scientific progress will be needed before this becomes possible, combining AI and CRISPR might create healthier future generations. But the troubling questions arising from each technology would be compounded and new, unique issues could come out of “optimization.” When will AI models of genetics be good enough to use for genome editing? When will CRISPR techniques be good enough to make the recommended edits accurately? What is the difference between preventing a disease and “enhancing” the next generation, and how will AI try to tell the difference? Optimizing for health is probably the first way these technologies would be used together. But optimizing human biology for other parameters could also be possible—including physical or, conceivably, cognitive attributes. It could even allow for humans to be optimized for other functions, like space travel. Of course, using AI and CRISPR for optimization would require public support. Recent polls suggest the American public is not ready to start editing DNA in human embryos, but this may not always be the case. One way public opinion on optimization might change is by thinking about “biology as a machine.” Experts tend to talk about biological concepts with metaphors often used in engineering—like calling cells “factories”—with DNA as the “software” for this machine. Should the public come to think about gene editing as “patching” or “debugging” software, the concept may become less foreign and more acceptable. Ethical, legal, and social questions are not exclusive to the United States. Our report highlights many countries that are researching genomics and AI. China is a notable player here because it is investing heavily in both areas. Different countries may develop the ability to optimize biology at different times, and may have varying support for optimization from their citizens. Policymakers internationally will therefore need to think hard about how to prevent problems that could come from different countries having different approaches to AI-driven CRISPR editing. How do we proceed? To get started, our Wilson Center report makes a few recommendations. First, Congress should request an in-depth study of the ethical, legal, and social issues raised by human optimization. This will help policymakers and citizens focus on the most relevant and actionable problems. Second, more research should be done on AI and CRISPR to help explore the risks of using the technologies. Third, many types of stakeholders should begin talking about what regulation could or should look like. Fourth, the United States should pursue international research efforts to bring experts together and make decisions about how to proceed with research. Finally, policymakers should work to “harmonize” regulation with other countries to ensure international collaboration on AI and CRISPR. Implementing these recommendations will require time, energy, and cooperation between citizens and governments. Combining two emerging technologies will undoubtedly raise complex and contentious questions, but could also lead to great benefits in health and international collaboration. The key will be finding the right balance between promoting innovation and addressing these difficult quandaries. Walter G. Johnson recently graduated from the Masters in Science and Technology Policy program at ASU’s School for the Future of Innovation in Society. He is currently a student at the Sandra Day O’Connor College of Law at ASU.